October 1, 2014 marks the fifteenth anniversary of the first Talking ATM in the United States. On this date in 1999 San Francisco unveiled the first accessible ATM in this country. Twelve others had been installed earlier by the Royal Bank of Canada as a result of advocacy by blind Canadians. Talking ATMs deliver spoken instruction and an accessible means to enter information so people who cannot see an ATM screen can bank independently. The first San Francisco Talking ATM was built by Canadian accessibility company T-Base, and branded with the logo of the San Francisco Federal Credit Union. The machine was installed in the City Treasurer’s office as part of an effort to provide a fully accessible City Hall. Read the 1999 article about the nation’s first Talking ATM. Three months before that first installation, Wells Fargo had announced the first plan in the nation to install Talking ATMs. Read the June, 1999 Wells Fargo press release. And six weeks after the City Hall announcement Citibank held a press conference in Berkeley to highlight its new Talking ATM. Read Citibank’s 1999 press release. Early the next year Bank of America announced its first fifteen Talking ATMs. Read the first B of A Talking ATM release. The rest, as they say, is history. Today every ATM operated by Wells Fargo, Citibank and Bank of America is a Talking ATMs. All of Chase’s ATMs talk too, as do ATMs across the country and, increasingly, the world. As of March 15, 2012, federal regulations specifying features and functions of Talking ATMs (finally) became mandatory in the U.S. Read the post about the DOJ requirements. In May 2013 Hungarian activists used the CRPD to convince the United Nations to require the largest bank in their country to install Talking ATMs. 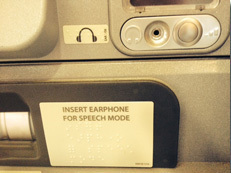 Read about the historic CRPD ruling about Talking ATMs. Congratulations to advocates around the world who worked hard to make accessible banking technology a reality. Thank you to the financial institutions that engaged in Structured Negotiations with the blind community on the issue of Talking ATMs. Here’s to many more years of accessible technology in all sectors of society. You can read summaries, with links, of all the Talking ATM press releases issued as a result of Structured Negotiations in the Talking ATM Press Release Category of LFLegal. Want to learn more about the history of Talking ATMs? Visit the Talking ATM History Category of this website. There you will find short summaries and links to posts on the subject. You can also visit the International Category of this website for posts about Talking ATM installations around the world. Fifteen years ago the first Talking ATM was installed in the United States. It was placed in San Francisco City Hall. Since then, tens of thousands of Talking ATMs have been installed. These ATMs help blind people bank privately without help. Federal rules require ATMs to talk wherever there are ATMs.